Saved from Hell or Saved from Sin? 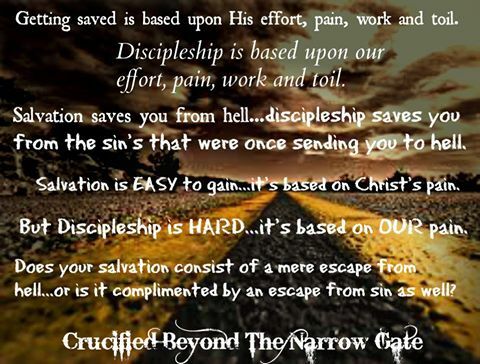 Does your salvation consist of a mere escape from hell...or is it complimented by an escape from sin as well? I believe in eternal security...but I also believe in eternal recompense for the deeds done in the body (2 Cor 5:10). If there is no accountability for how we live after salvation, why do we have a judgment seat for believers? Salvation comes to all who believe by faith. Likewise, intense judgment and loss of reward comes to all who have believed but who refuse to suffer loss (forsaking of sin) in order to follow Him. Christ takes this VERY seriously. Even though we are saved, we will NOT get away with disobedience. So, the Once saved always saved crowd who use grace as a means to sin, will be in for a rude awakening at the Judgment Seat. Mind you, REWARD is NOT salvation. Salvation is based upon Christ's work, effort and toil. One cannot be rewarded for an effort he did not exert. To say otherwise, it to say you believe salvation is by works. Salvation (eternal life) is based upon HIS work on the cross. Period. However, once we are saved; our discipleship and commitment to Him is based on OUR work, effort and toil. Our discipleship (and the reward it will garner) is completely and absolutely based upon OUR work...that is, the carrying of our cross. "He who loses His life (what sin wants you to do, or what you want to do with it) for my sake will find it" Luke 9:24 (this implies work, toil and effort----This must be referring to reward....otherwise Christ is propagating a salvation by works (why would He do that!) Salvation, forgiveness and the escape from hell is NOT by works (Romans makes this very clear). But the quality of our life and reward WITHIN the Eternity Christ has provided IS based upon our works. THUS THE DETERMINING FACTOR AND VERY REASON THERE IS A JUDGMENT SEAT FOR BELIEVERS. So, everything we do, even after salvation, will be scrutinized at the Judgment Seat (unrepentant items). We must use grace as a means to perpetuate holiness...lest we be found utilizing it as a method by which to perpetuate unholiness. Such things will be severely dealt with at the Judgment Seat of Christ. Rewards differ according to the individuality of each person. This is due to the fact that conduct differs from person to person and individual to individual. According to how we live our life AFTER we are saved will determine the reward (or loss of it) each one receives. (2 Cor 5:10, 1 Cor 3:10-15). Have you ever wondered why there is a Judgment Seat for believers? If everyone is going to be treated just the same...if eternal life IS the reward (the way it's taught today)... then why a Judgment Seat? If everyone who is saved is completely and utterly equal...why do we need a court room setting to determine ANYTHING? Yes, I agree, where eternal life is concerned (the immediate effects of Christ's work on the cross), ALL who are saved ARE indeed equal. But where individual conduct is concerned (the immediate effects of our work in the carrying of our cross), there are vast differences from one person to the next. Thus, the Judgment Seat. It will be utilized to determine the level of each one's reward (according to how he lived after being saved). It will also be utilized to determine the loss of each one's reward (in regard to disobedience). The reward is in ADDITION to the salvation that comes through Christ and Christ alone. According to the pain He suffered and endured on the cross, He now provides us the strength to endure our pain in the bearing of our own cross. There is a swarming multitude of people who are claiming salvation...but there is an epidemic of those who claim to be His disciple. For this reason, judgment day is going to be a surprise for most. The only thing most modern churches teach is how to "say that little prayer". Then they cut you loose without ANY bit of time, attention and care in relation to discipleship. The Lord told us to "go into all the world and make DISCIPLES". But instead, the church has "gone into all the world to get people to say a little prayer"....then, they cut them loose like a father who refuses to take care of his children. Thus, the bastardization of modern Christianity. Strong words, I know. But such a vile and serious situation requires strong words to accurately diagnose it and hereby respond to it. If your Christianity is based upon a little prayer once uttered (to save you from hell) but completely lacks the freedom to live apart from the things that were sending you to hell...your Christianity lacks the outward evidence of an inward condition that you say is real. Where there is smoke there is fire. The smoke (holiness in daily conduct) is the billowing evidence that points to an inwardly raging fire (authentic salvation). If you are embodied with the literal fire of Christ...smoke will naturally billow forth...giving irrefutable evidence of an inwardly raging condition. If salvation to you, is just a "get out of hell free card" without any commitment unto the deliverance of the sins that were at one time sending you there...you're NOT His disciple. Therefore, a great urgency should arise to examine yourself to see if you are even in the faith (2 Corinthians 13:5).